Some time ago, Hamlet Au pondered if there were any case studies, with empirical evidence, demonstrating learning in Second Life as compared to other methods of instruction. I took him up on his challenge, offering the success of the U Texas system's venture. He was not impressed, though we both agreed that Ken Hudson's Canadian Border-Crossing Project did demonstrate the validity of immersive learning. With this in mind I did a short literature review, a useful "twofer" since I was also doing research for a forthcoming article written with Viv Trafalgar. We have not found any case studies of the use of SL or OpenSim in a literary-studies setting, the focus of our article. Two studies surfaced. One showed some benefits, but with a small sample size and no control group, and another showed no benefit in an engineering program where, the authors note, they had not provided a good orientation for their students. 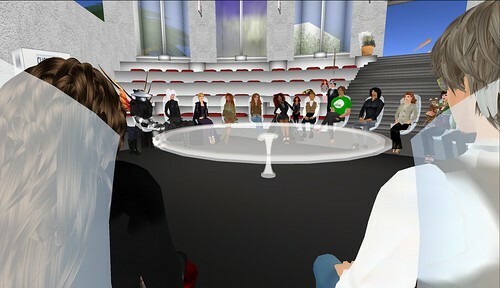 With these articles under my virtual arm, I put a question to the Virtual Worlds Education Roundtable in a session called "Making the Case for Avatars": What are the Advantages over Teleconferencing? I was impressed by the responses, and you can read a transcript of our talk here. Note that for those not wanting to wade through a HUGE text transcript, I aggregated all links at the start. Peak Oil: Should I Be Glad?